This is a really beautiful log cabin designed as an extra seating area for the family. What makes it really stand out is the stylish veranda included at the front of the building. Made from pine tongue and groove cladding, the building benefits from a very tough and durable design. The veranda is sheltered by a large overhang on the gentle sloping apex roof. This provides great protection against the rain, as well as shading you from the sun’s rays in the hot summer months. There are large single glazed windows which can be opened to provide ventilation into the cabin. The doors are also glazed, helping to boost the amount of natural light inside the building, as well as adding to its attractive design. The doors come with a mortise lock and key, with stylish handles. This ensures the cabin is very secure. A 10 year anti-rot warranty gives you reassurance that the cabin is built to withstand the variable UK weather. This is an important feature when you’re spending a large amount of money on a building. 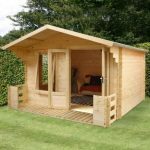 With chalet joint corner connections, this cabin is really stable and it benefits from a unique design. All in all we highly recommend this building and feel it would look great in both traditional, as well as modern gardens. High cost. However, you are paying for a very high quality, attractive building. 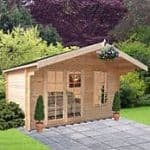 This is a fairly small wooden log cabin which should fit into most gardens. There are no strict rules on how this cabin can be used, though initially it is thought to have been designed as a home office. The attached veranda makes it an ideal summer house, offering a shaded outdoor seating area. Its versatility is one of the things we love about this building. The thing we like most about the measurements of this cabin is that it actually takes up very little space. The depth and width of the building are pretty compact compared to other log cabins. However, it still gives you a great amount of interior space. It also has a substantially tall roof. At 2.35m high, it is taller than most buildings of the same size, which means you benefit from a lot of internal height. This makes it very comfortable to walk around in. Another unique feature of the cabin is the overhang of the veranda. Like the rest of the building, it benefits from an apex roof which ensures great water resistance. 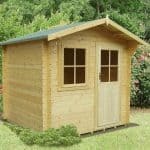 Unlike wooden sheds, log cabins tend to always offer an exceptionally durable floor and roof and this building is a great example. The roof and the floor are both made with 19mm tongue and groove cladding. This makes it ideal for even the heaviest furniture and equipment. The roof is a particularly striking feature, benefiting not just from a gentle sloping apex design, but also from an attractive veranda with an extraordinary large overhang. This overhang is supported by stylish corner joints chalet connections. This attached overhang and the entire roof is covered with a heavy duty roofing felt. However, to get the most out of the cabins great durability, we would recommend upgrading to either Superior duty felt or the fantastic Armourshield Shingles. More about both of these options can be found under the Customisation and Extras section of this review. What you see is what you get with the cladding of this building. This is quite unusual as the majority of log cabins in the Waltons range come with numerous customisation options, including the ability to make the walls of the cabin thicker. However, at 19mm thick, really you don’t need thicker walls. It provides excellent insulation and fantastic protection against rainwater. It is also going to be incredibly difficult for a potential thief to break through. The interlocking design of the cladding ensures there is minimum risk of drafts. It is also unlikely to warp; though there is an adequate expansion gap built into the cladding to ensure if it does, it won’t pose any threat to the stability of the cabin. A unique feature of this building is its corner joints and chalet connections. They offer extreme rigidity and also add a more stylish design. The strong, secure construction is followed through to the interior of the building with a superior quality frame. It is also worth noting that the entire cladding is created with pine. This gives it a lighter, more attractive appearance. 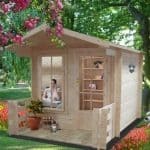 Though it is constructed with very thick, incredibly durable double tongue and groove cladding, the cabin will need to be treated with a high quality preservative. However, the actual frequency of treatments will depend upon the treatment you use. Water based treatments will provide a very good amount of protection for around a year, then they will need to be reapplied. Spirit treatments on the other hand can provide protection for more than a year. So obviously if you’re looking to minimise maintenance, the spirit based treatments are the best option. It isn’t just the less frequent applications that make spirit treatments worthwhile. They also offer the most protection. This is because they work both inside the timber as well as on the surface. That’s why we always recommend these treatments regardless of the type of cladding used. If treatment instructions are followed, the cabin will benefit from a 10 year anti-rot warranty. The double doors of the cabin are single glazed, just like the windows. What we really like about the door’s design however is that they are secured with a lock and key. A stylish door handle is fitted, just like you’d find on the front door of your home. The windows have a tall design, ensuring they let in a decent amount of light. They can also be opened and closed, enabling you to ventilate the building in warmer weather. This makes it a lot more comfortable to use in the summer and also helps to limit the risk of condensation. The built in lock on the door is a lot more secure than one simply fitted onto the surface. It will be a lot harder for a thief to pick the lock and they won’t be able to remove it. There’s also the protection given from the double tongue and groove construction. The 19mm thick timber logs are going to make it difficult for thieves to break into. So security wise, it is pretty impressive. Privacy wise, you will need to install some form of window covering if privacy is important to you. However, adding curtains or blinds won’t be too expensive and it could actually help you customise the building, giving it a more homely feel. Log cabins tend to come with a huge range of customisation options and extras. However, this one comes with just two. The only thing you can upgrade is the roof. The positive of this is that the building clearly comes with a superior quality design that doesn’t really require you to spend any extra money. The roofing upgrades will enhance the life of the building, but the heavy duty felt included does last at least a year so it’s something you don’t have to worry about right away. The two options you have include Superior Duty felt and Armourshield shingles. Both offer decorative benefits as well as stronger protection against the elements. However, as you’ll see the shingles come at a much higher cost. So if you’re on a budget, the Superior duty felt would be the preferred choice. Superior duty felt is made up of fibreglass which is known for its long lasting design. The mineral felt supplied with the building is strong, but it will perish as time goes on. Upgrading to the superior duty felt will ensure the roof withstands the elements for years to come. It is also supplied in two different colour options including a sophisticated and traditional charcoal and a more unique olive green. The shingles are the highest quality option and they boast a textured, roof tile design. Like the Superior felt, they come in a choice of charcoal or green and each contains 6 packs which is just enough to cover this cabin. What makes these so impressive is the fact they have been technologically advanced. They offer a distinct look that will really make the cabin stand out. Whilst they do offer superb aesthetic benefits, they are also the most weather-resistant roof covering available. So if you do have the extra money, we would recommend choosing the shingles over the Superior felt. After all, it is the only customisation option available so it makes sense to invest in the very best protection. This is a fabulous building with an outstanding quality. Both inside and out, Waltons have maintained a very high standard. Despite requiring treatment, the thick cladding and interior framing gives this cabin a very long lasting build. Even the roof and floor are built with exceptionally thick timber. Compared to a lot of cabins out there, this one comes with a more compact design. However, it is deceptively spacious despite its compact exterior measurements. This isn’t the easiest log cabin to build and it is advised that you have some construction experience before attempting it. If you don’t it could be worth taking advantage of the installation service. This does come at an additional cost but it will ensure the cabin is built correctly and it eliminates any stress; allowing you to simply enjoy your new cabin. 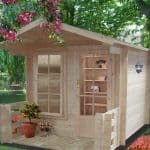 As with all sturdy log cabins, the initial cost is high, but it does offer extremely great value for money. Taking into account its attractive style and range of excellent features, the durability alone makes it worth the investment. Final Thoughts: We can’t recommend this great log cabin enough. We love its timeless, beautiful design. It is versatile enough to fit into both modern and traditional gardens and it offers some pretty brilliant features. The veranda is the main highlight of the cabin, providing a sheltered seating area which you can use in all weathers. Inside it has a generous amount of space and the large, tall single glazed windows and doors ensure it benefits from a good amount of natural lighting. The 19mm tongue and groove construction gives it a very thick, weather protective design. 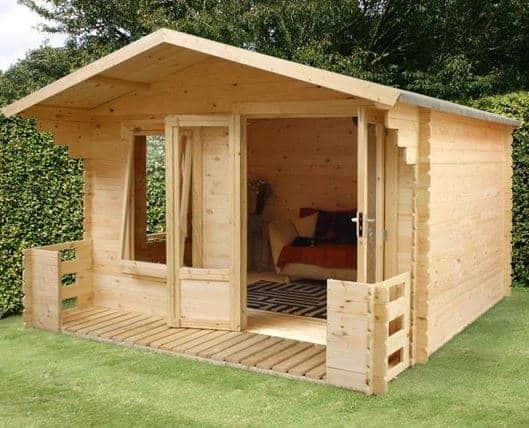 If you’re looking for a simple log cabin with a unique style, this is definitely one to consider.